I have back/neck pains can a Registered Osteopath help? Yes, Registered Osteopaths are trained specialists in diagnosing the cause of your back or neck pains and then providing an appropriate treatment to help you get better. I know you treat the back and neck, do you treat other joints and musculo-skeletal soft tissues? 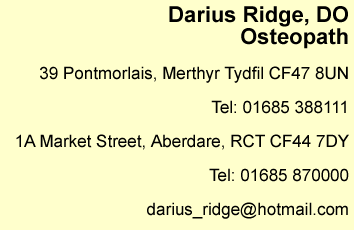 Yes, Registered Osteopaths are trained specialists in diagnosing the cause of your musculo-skeletal soft tissue and joint problems. Please see our page about what Osteopaths can treat for examples. I've been told by my General Practitioner (GP) that I've got to live with my joint/muscle pains, is this correct? No, osteopathic treatment can generally help reduce pain and improve movement for a wide range of complaints. Do I need to see my GP before coming in for treatment? No, it's not necessary (unless you need referral under the terms of your health insurance). With your permission, we may need to notify your GP of the treatment that you have had. Unfortunately, treatment can only be given privately at present. Will my health insurance pay for my osteopathic treatment? Most health insurance policies include it, but check on your policy! Generally no. If you are in a lot of pain, a gentler approach can be used to work within your tolerance. Will you 'crack' my back? The technique that makes a 'cracking' sound is often effective if it's appropriate for your condition. There are many other approaches that can be used if you prefer not to have this type of treatment.